Dark tourism is a relatively recent form of tourism that involves visiting places associated with disaster, death or suffering. Famous examples in the world include the Nazi concentration camps, the Chernobyl field, or the traces left by the atomic bombs in Hiroshima and Nagasaki. In Romania, probably the most famous destination of this kind is the Bran Castle, somewhat associated with Vlad Țepes (Dracula) and his alleged brutal practices. To this list one may add the communist prisons as well as a series of natural disasters, including Geamăna. Here, waste was discharged from the Roşia Poieni copper pit, so that eventually the whole village was sunk and turned into a decanting lake. The tragedy was not necessarily a macabre one, because it slowly progressed in time, in a more or less controlled fashion. The vast majority of the 1,000 souls who lived in the village before the mining operation started were compensated and agreed to move, but a large number of people also decided to stay. They gradually had to climb higher up the hill to avoid the ever-increasing exploitation effects. They were the ones that suffered most, being eventually forced to leave as well. Today, only a few families have remained in the area, almost completely isolated from the rest of the world. However, although hardly accessible, the village (or what remains of it) has begun to be visited by a growing number of tourists, interested in the history of the place and the effects of the ore spills. Virtually all that remains of the old Geamăna is the tower of the church, the rest of about 400 houses being underwater. However, because of the waste spilled in the pond, the water has an interesting color, with green and red shades, being a highly appreciated destination amongst photography enthusiasts. 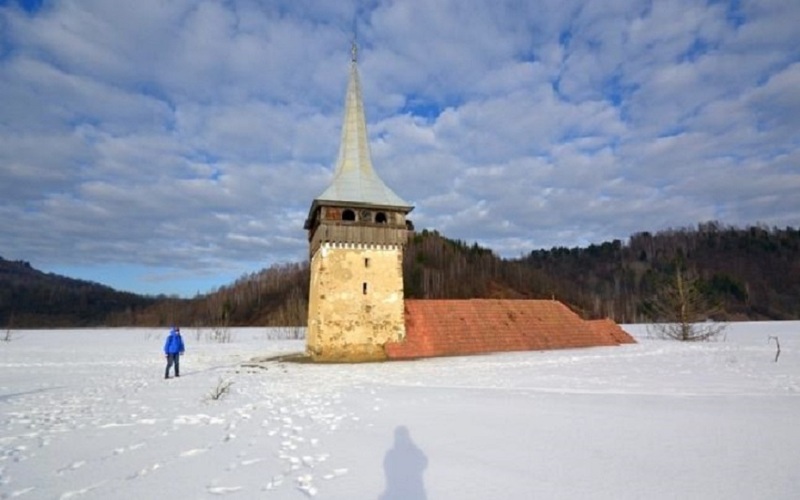 Also, in winter, when the pond is frozen, one can even get up to the church tower, the landscape being once again impressive and extremely favorable for photographs.